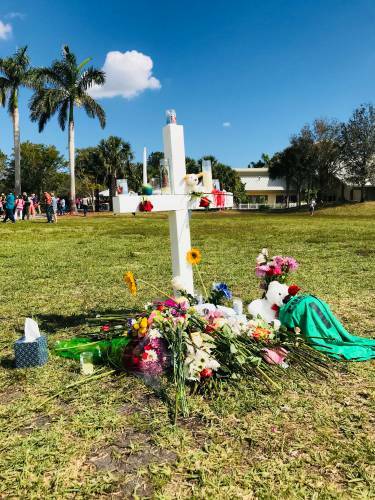 LOUISVILLE (PNS) Thursday marks the one-year anniversary of the Parkland, Florida school shooting, which killed 17 students at Marjory Stoneman Douglas High School. Carl Horton, coordinator of the Presbyterian Peacemaking Program, points out a new resource called “Through a Mirror Dimly.” (Find it here.) Gina Yeager Buckley wrote the discussion guide for youth to talk about, pray about and think about life and faith following a violent situation. Presbyterian Peacemaking Program created a Gun Violence Prevention webpage (here). In addition, Horton said, “we are developing a year-long series of webinars on a variety of topics related to gun violence.” Those webinars should begin later this year. The Presbyterian Peacemaking Program and Presbyterian Peace Fellowship developed the No Guns in God’s House signs, which can be accessed here. universal background checks and waiting periods for all gun purchases. a ban on semiautomatic assault weapons, armor piercing handgun ammunition and .50 caliber sniper rifles. Schedule a screening of “Trigger: The Ripple Effect of Gun Violence” for your group or organization. Visit the PDA website to order materials and get suggestions on hosting a screening. Join or form a local chapter of “Heeding God’s Call,” a faith-based movement to end gun violence. Visit http://www.heedinggodscall.org/ for more information. Learn about your state’s concealed carry laws (that may allow guns to be carried openly, including into houses of worship). Encourage your places of work and worship to prominently display signs that prohibit carrying guns onto their property. Encourage those you know (citizens, hunters and law enforcement officials) who regularly handle weapons properly to be wise examples in reducing risks and teaching how to prevent the misuse of deadly force. All suggestions are based upon the recommendations approved by the 219th General Assembly (2010) in “Gun Violence, Gospel Values: Mobilizing in Response to God’s Call.” PDS #24-0452-11-002.